We lived in the same village and met on a night out in 2003. However, Tony had already booked to go travelling, so we agreed to keep in touch while he was away, and finally got back together when he returned in 2005. Tony proposed in Volterra, Italy in September 2012. We had been together for seven years at this point and I had absolutely no idea he was going to do it. I was completely blown away. Tony had even been to see my dad to ask for his permission, which made it even more special for me. Why did you choose to get married in Spain? We had spoken about how we imagined our wedding day would be on a few occasions, but initially wanted different things. I had always dreamed of a big white wedding in England, but Tony was all for the sunshine abroad. However, I soon changed my mind after Tony’s proposal, as I refused to get married in the rain. I then spent one Sunday afternoon looking at destination wedding venues and came across a link for Sunshine Weddings Spain. I sent them an email and we then booked our flights to go out and start looking for venues with them a few months later. When we met with Sunshine Weddings Spain they had various venues lined up for us. However, the minute we arrived at this great beachside venue in Estepona, we knew it was the one. We fell in love with the stunning decor and picturesque views immediately. 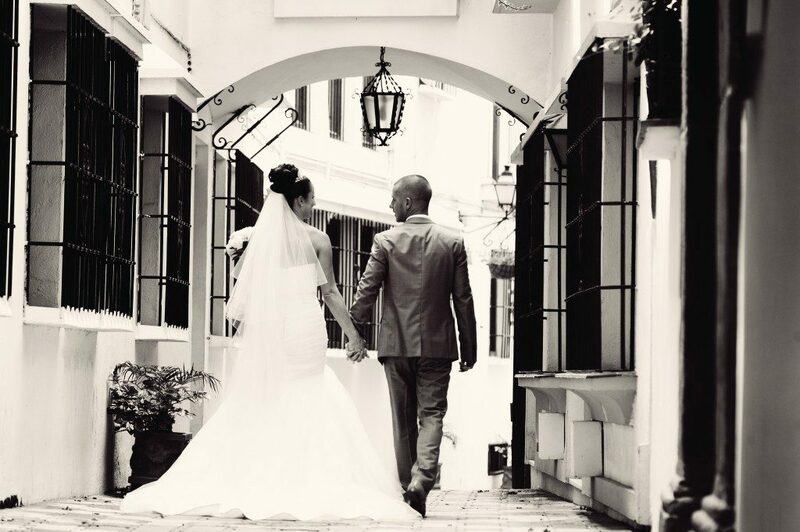 We decided to have our ceremony in the Encarnacion Church in Old Town Marbella. We could not have found a more beautiful church to be married in. We were completely awestruck by it and our guests still continue to talk about it. Find out all the beautiful details of Stacy and Tony’s wedding in Part 2….